Leicester landed their fifth Premiership title - and first since 2002 - as they moved to within one victory of an unprecedented trophy treble by blitzing Gloucester 44-16 at Twickenham. 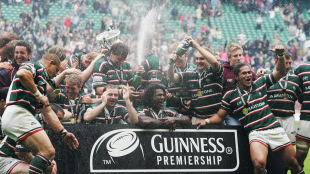 The seven-try Tigers were crowned champions in emphatic fashion, completing a league and cup double after lifting the EDF Energy trophy last month. Victory over Heineken Cup final opponents Wasps at Twickenham tomorrow weekwould see Leicester complete a remarkable hat-trick in head coach Pat Howard's final season before he returns home to Australia. Gloucester, despite finishing top after the 22-game regular season, offered merely token resistance as Tigers ran in tries for wing Alesana Tuilagi (2), skipper Martin Corry, scrum-half Frank Murphy, flankers Shane Jennings and Lewis Moody, plus fly-half Andy Goode, who also slotted three conversions and a penalty. The west country club proved a crushing disappointment, seemingly in awe of the occasion as they proved unable to unleash their exciting backs Ryan Lamb, Anthony Allen and James Simpson-Daniel. But Leicester were in no mood to offer condolences, cruising home without seriously breaking sweat in front of a 59,000-strong crowd. English rugby's play-off showpiece provided a fourth mismatch in five years - only Wasps' tense 2004 victory over Bath has proved remotely close - as Gloucester capitulated, with three Willie Walker penalties and a Ryan Lamb try sending them and their supporters home completely unfulfilled. Previous league meetings between the sides this season produced a draw at Welford Road and a 28-24 success for Gloucester in the Kingsholm return, yet Leicester had no intention of following that nerve-wracking script and they effectively had the final sewn up by half-time. Gloucester confirmed a major blow just hours before kick-off when their skipper Marco Bortolami failed to recover from a knee injury suffered during the semi-final victory over Saracens seven days ago. Will James replaced him in the second-row, partnering South Africa-bound England tourist Alex Brown, with flanker Peter Buxton taking over as skipper. Leicester, having already lost England scrum-half Harry Ellis through a potential World Cup-ending knee injury, avoided any late stress as they targeted the second stage of a potential trophy treble. Gloucester though, made the early running and Walker slotted a fifth-minute penalty in miserable conditions under leaden skies and a constant threat of thundery showers. But Leicester did not require long to settle, and they moved ahead in somewhat controversial circumstances after 10 minutes. Ellis' replacement Murphy went for the line from close range, and although he appeared to lack the necessary downward pressure, video official Geoff Warren confirmed a try after being consulted by referee Dave Pearson. Goode slotted the conversion, and although Walker booted a second penalty midway through the half, Tigers had the bit between their teeth. Gloucester's cause though, was not helped when stand-in captain Buxton lasted just 16 minutes before going off nursing a wrist injury and being replaced by Jake Boer. As the inteerval approached, so Leicester stepped up a gear, and two tries in eight minutes left Gloucester at sixes and sevens. Slick approach work between Tuilagi and full-back Geordan Murphy proved sufficient to leave Gloucester in disarray, and Tuilagi smashed through weak tackling for a try before Goode's second penalty strike made it 15-6. Gloucester knew they had to close things down before the break, but they failed miserably as Goode and wing Seru Rabeni combined and skipper Corry crashed over. Goode added the extras, taking Leicester 22-6 clear, raising prospects of another Twickenham nightmare for Gloucester four years after Wasps blitzed them 39-3 in English rugby's first play-off final. At least Gloucester came out firing for the second period, with Walker completing a penalty hat-trick, yet Leicester quickly ran in their fourth try. Gloucester's defence again could not handle the pace of Tigers' attacking game, and Goode coasted over for a clinching try, hoisting Leicester 18 points clear. But Leicester were not finished, adding further tries on 52 minutes by Tuilagi and Jennings, which left Gloucester in pursuit of a consolation, which duly arrived when Lamb intercepted an ambitious midfield pass for a touchdown that Walker converted from the touchline. Leicester though, knew the game had been won, and they sent on 17-year-old scrum-half Ben Youngs, who created a slice of history in the process. He became the youngest Twickenham finalist - domestic or European - in 35 years, breaking the record set by 18-year-old Ralph Knibbs for Bristol against 1983 John Player Cup final opponents Bath. And it provided a fitting finale to a memorable day for Leicester, who will take some stopping when they return to south-west London in eight days' time for an eagerly-awaited appointment with Wasps. Gloucester: Walker, Foster, Simpson-Daniel, Allen, Balshaw, Lamb, Richards, Wood, Azam, Nieto, James, Brown, Buxton, Hazell, Narraway. Replacements: M. Davies, Califano, Eustace, Boer, Lawson, Adams, Goodridge. Leicester: G. Murphy, Rabeni, Smith, A. Tuilagi, Hipkiss, Varndell, Goode, F. Murphy, Ayerza, Chuter, White, Moreno, L. Deacon, Moody, S. Jennings. Replacements: Kay, Buckland, Corry, B. Deacon, Humphreys, T. Youngs, Vesty.